The problem, however, is that the person listed as the account holder is often not the person who downloaded the infringing material. Although not many judges address this crucial issue early on, there are exceptions, such as the one raised by Florida District Court Judge Ursula Ungaro. Judge Ungaro was presented with a case brought by Malibu Media, who accused IP-address “174.61.81.171” of sharing one of their films using BitTorrent without their permission. The Judge, however, was reluctant to issue a subpoena, and asked the company to explain how they could identify the actual infringer. Responding to this order to show cause, Malibu Media gave an overview of their data gathering techniques. Among other things they explained that geo-location software was used to pinpoint the right location, and how they made sure that it was a residential address, and not a public hotspot. Judge Ungaro welcomed the additional details, but saw nothing that actually proves that the account holder is the person who downloaded the file. “Plaintiff has shown that the geolocation software can provide a location for an infringing IP address; however, Plaintiff has not shown how this geolocation software can establish the identity of the Defendant,” Ungaro wrote in an order last week. “There is nothing that links the IP address location to the identity of the person actually downloading and viewing Plaintiff’s videos, and establishing whether that person lives in this district,” she adds. Even if Malibu Media can accurately show that the copyright infringer used the Internet connection of the account holder connected to IP-address 174.61.81.171, they still can’t prove who shared the file. 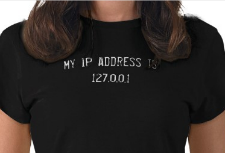 “Even if this IP address is located within a residence, the geolocation software cannot identify who has access to that residence’s computer and who would actually be using it to infringe Plaintiff’s copyright,” Judge Ungaro explains. As a result, the court decided to dismiss the case for improper venue. The ruling is crucial as it’s another unique order confirming that an IP address alone is not enough to launch a copyright infringement lawsuit. Copyright Troll watcher SJD points out that the same Judge has also issued orders to show cause in two other Malibu Media cases, which are also likely to be closed. While not all judges may come to the same conclusion, the order definitely limits the options for copyright holders in the Southern District of Florida. Together with several similar rulings on the insufficiency of IP-address evidence, accused downloaders have yet more ammunition to fight back.